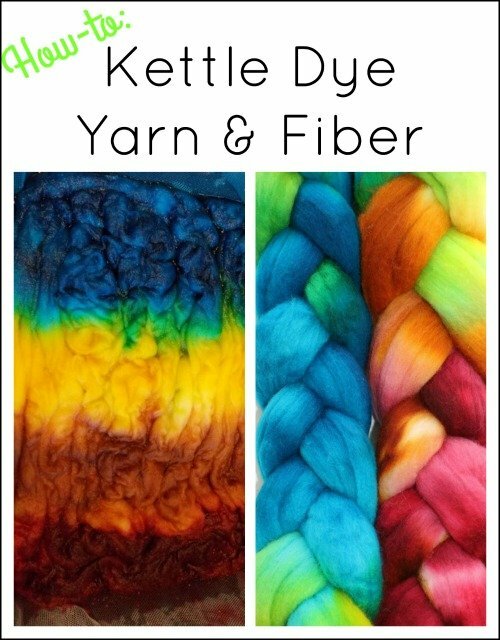 A few years ago, I shared a tutorial on how to Kettle Dye Yarn and I decided it was time for an update. The information in that post is all good but the photos are … well …. not so much. This was very early in my FiberArtsy career and as you can see, I had a lot to learn. 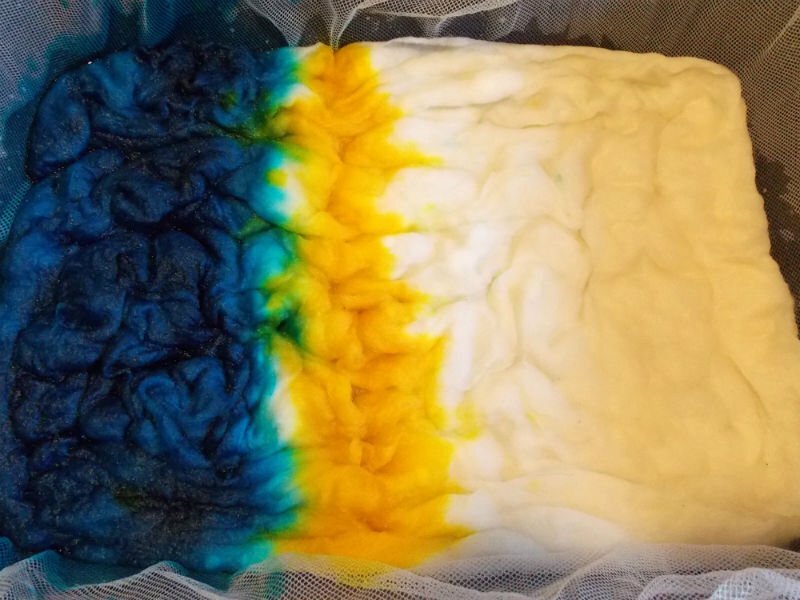 So, hence this new and improved kettle dyeing tutorial. 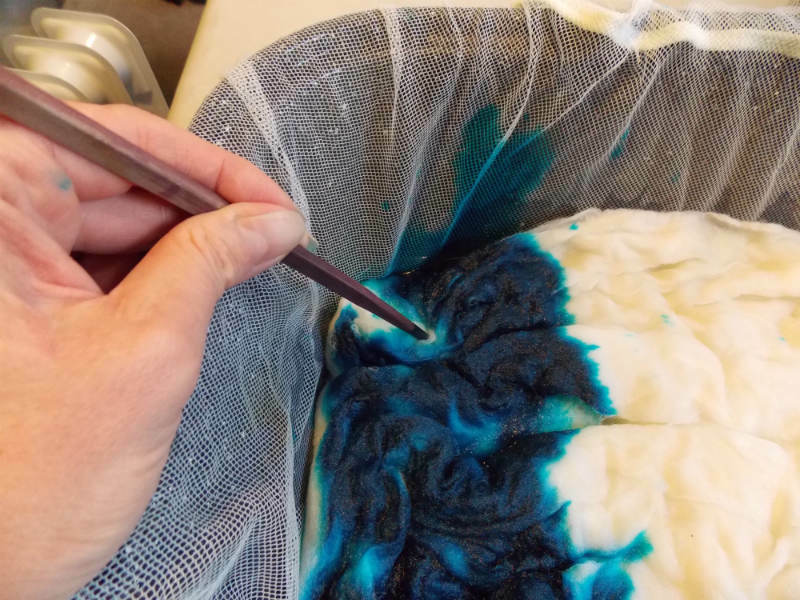 Note: In this post, I’m dyeing wool roving for an upcoming wet felting project. 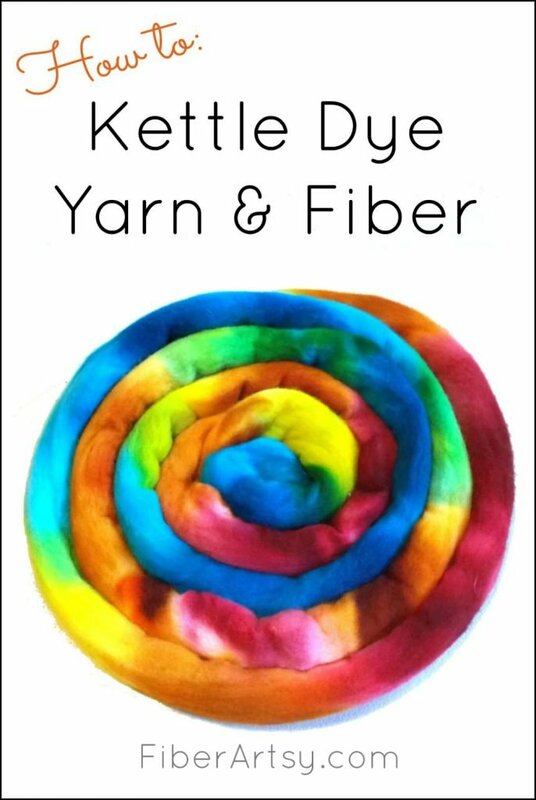 The steps to kettle dye yarn are exactly the same as for wool so feel free to substitute your favorite wool yarn s.a. wool, alpaca or mohair. 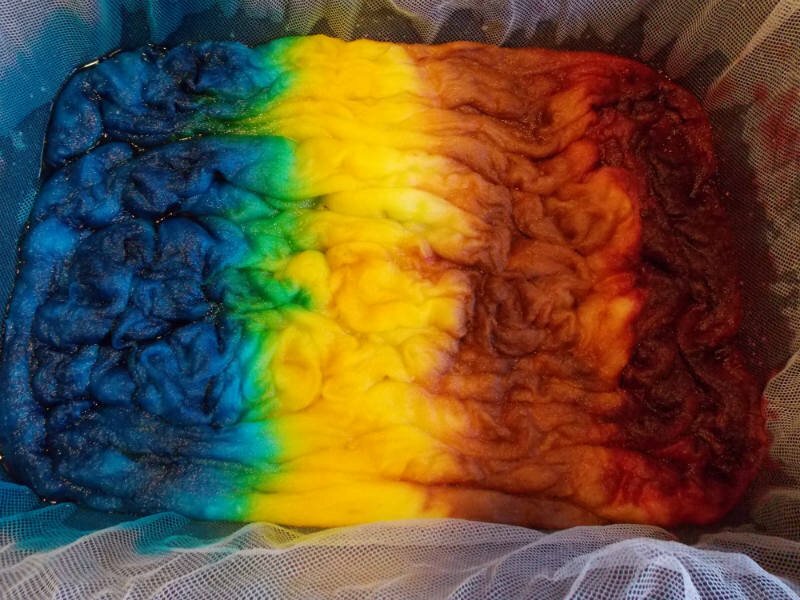 I used my favorite acid dyes for this wool, but feel free to experiment with Rit Dye or food colors such as Wilton. 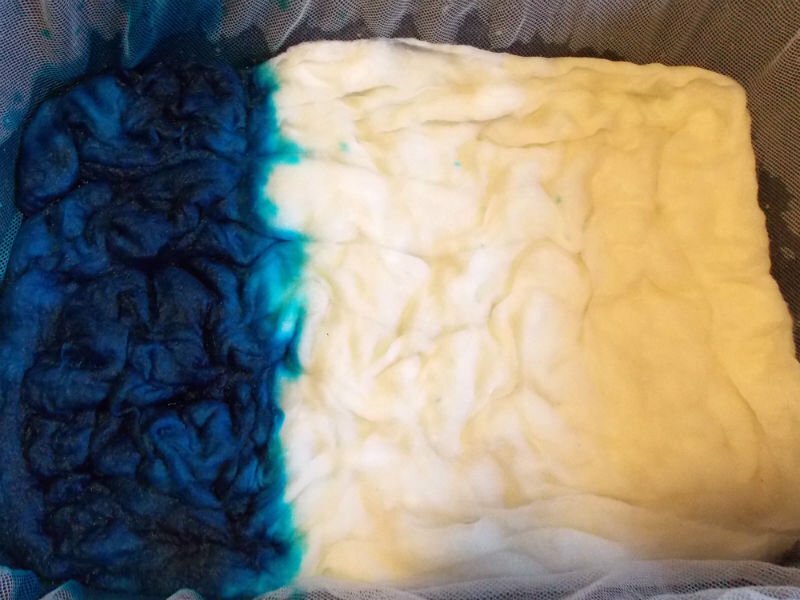 When you Kettle Dye wool, you dye and heat set the yarn or wool roving in one container. It’s a much quicker process than hand painting yarn where you paint the dye onto the yarn and then heat set it. The downside to kettle dyeing is that you have less control over where the dyes end up. They tend to run together and blend more than with hand painting, which I actually like. Mix your dyes in the mason jars according to the directions on the container. It can be a little confusing when you need to mix a smaller amount. 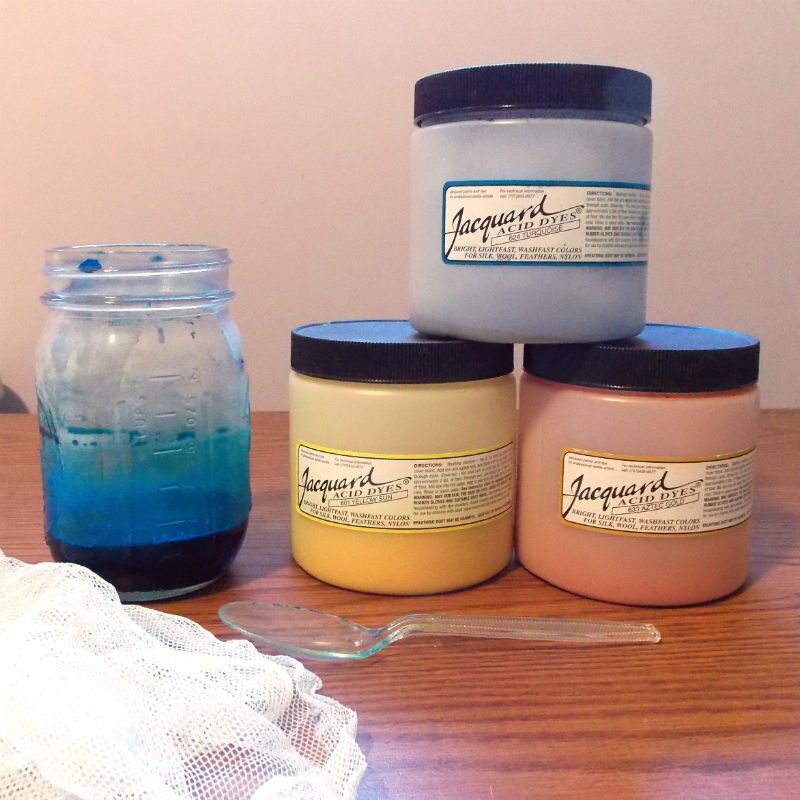 As a general rule of thumb, I use 1 teaspoon of dye powder per pint of water. Safety Note: Always wear your dust mask when handling dye powder! Put about one inch of medium warm water into the roasting pan and add appr. 1/2 cup of vinegar. Next, lay the mesh fabric inside the roasting pan. Now, carefully place the yarn or roving in the pan and push it down into the water. Let the fiber soak for about 30 minutes to ensure it is completely wet. 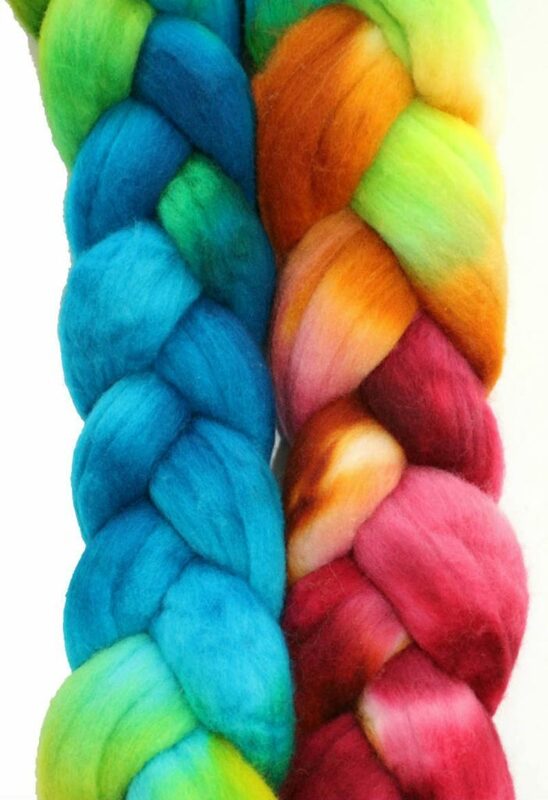 Take the first color and slowly and carefully pour some dye onto one section of the yarn/roving. 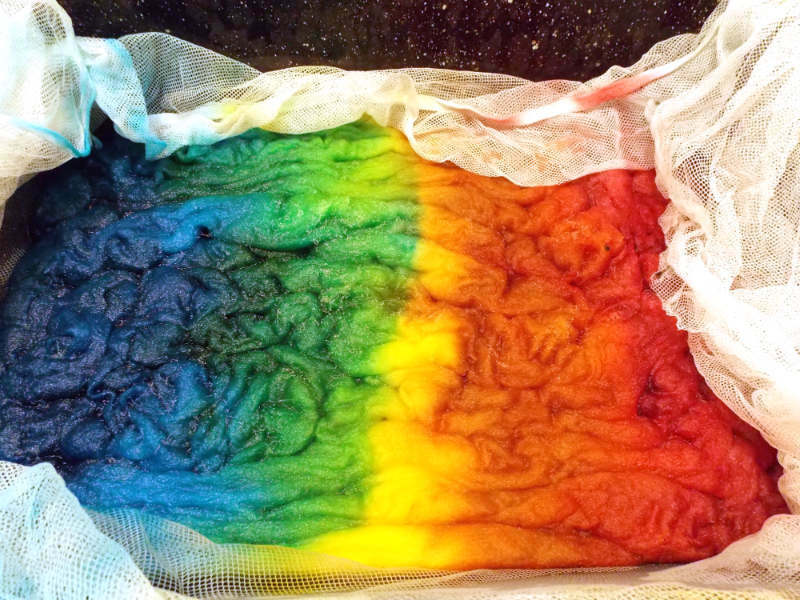 Add small amounts of dye … you only want as much as the fiber can absorb and no more. It’s a little tricky to know how much is enough but keep in mind, you can always add more. 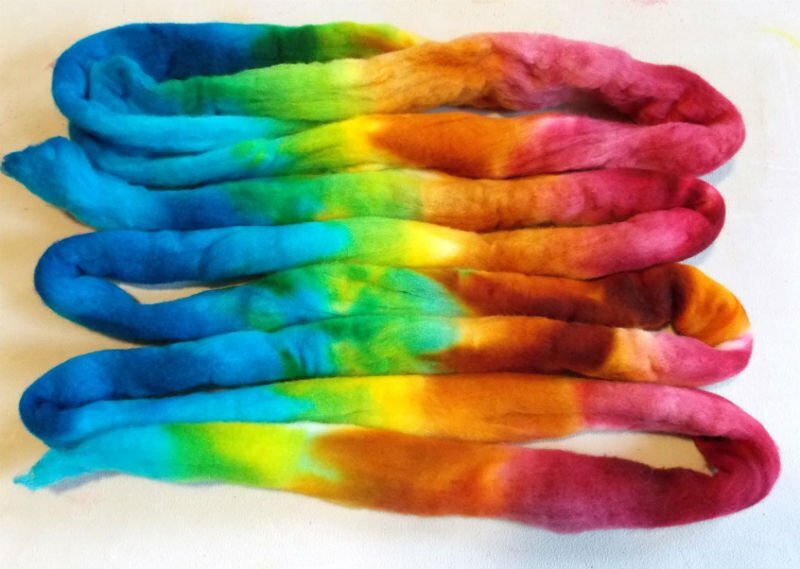 Using a spoon or chop stick, gently move the fiber so that the dye can penetrate the part you wish to dye that color. 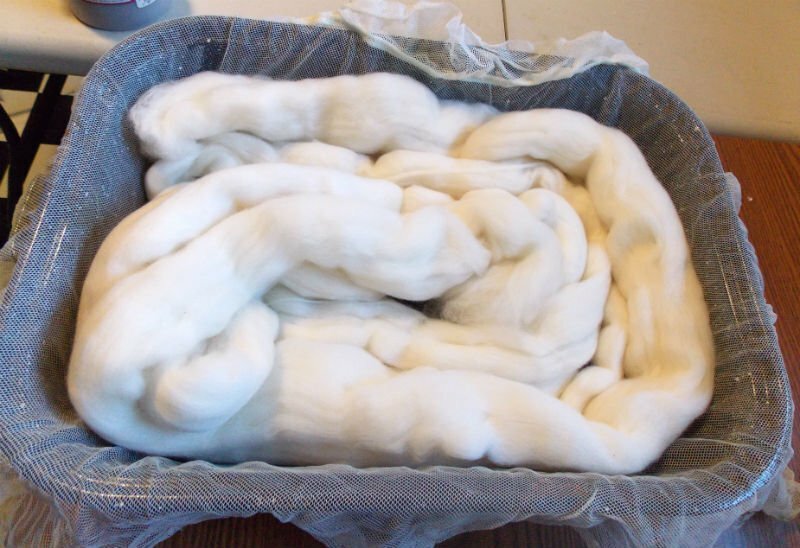 Be careful not to move your fiber too much, which can cause felting. Apply the second color near the first but not touching. 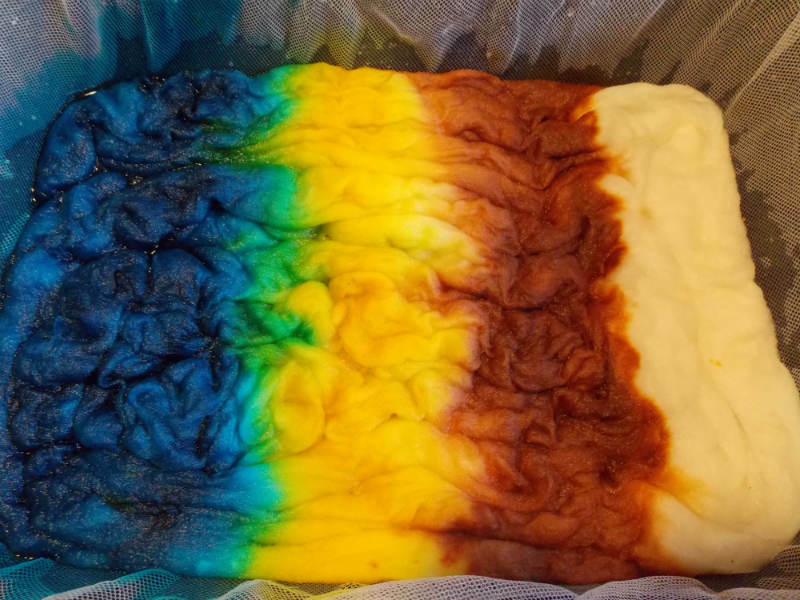 The dyes will migrate and blend on their own. See the green? Repeat with the third and fourth colors. Place the pot on the stove and turn the heat to medium. Gently simmer the fiber for about 40 minutes. 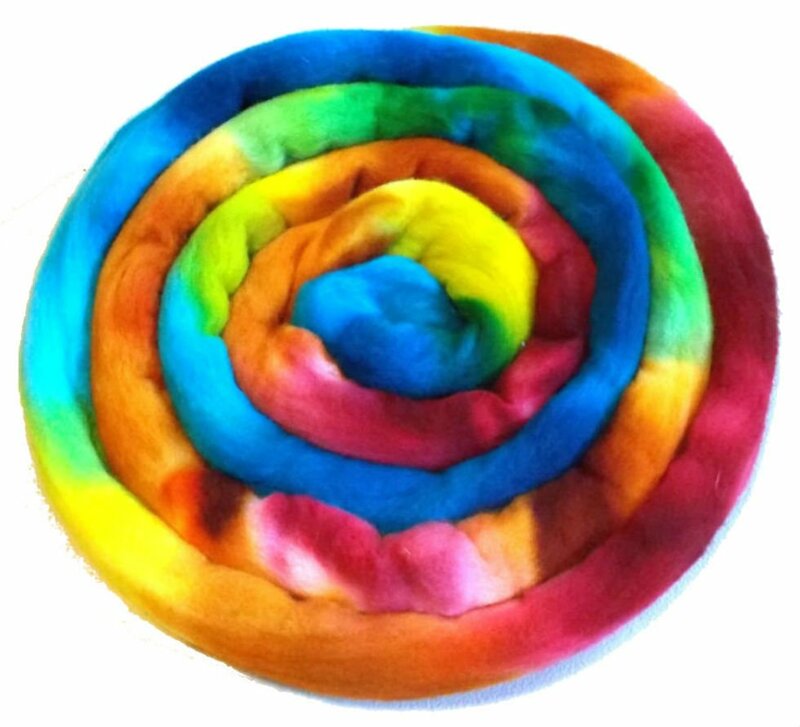 You don’t want big, rapid bubbles which can cause felting, just an easy simmer. Turn off the heat and allow the fiber to cool completely. At this point, the water should be mostly clear. 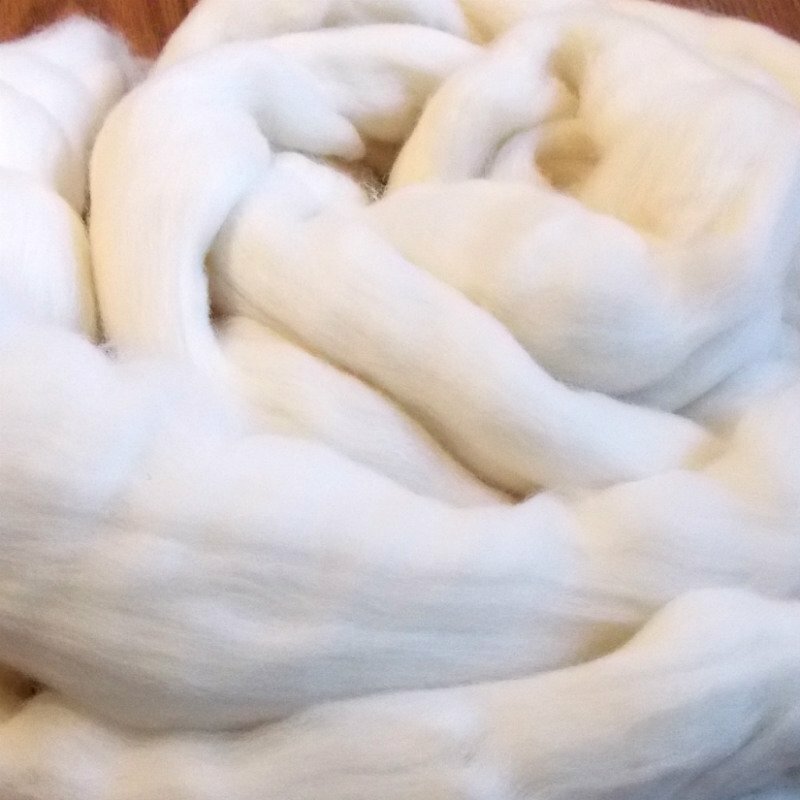 Very carefully, rinse your yarn/roving with room temperature water until it runs completely clear. Don’t handle your fiber too much or it may felt. Hang to dry and your yarn or roving is ready to use. 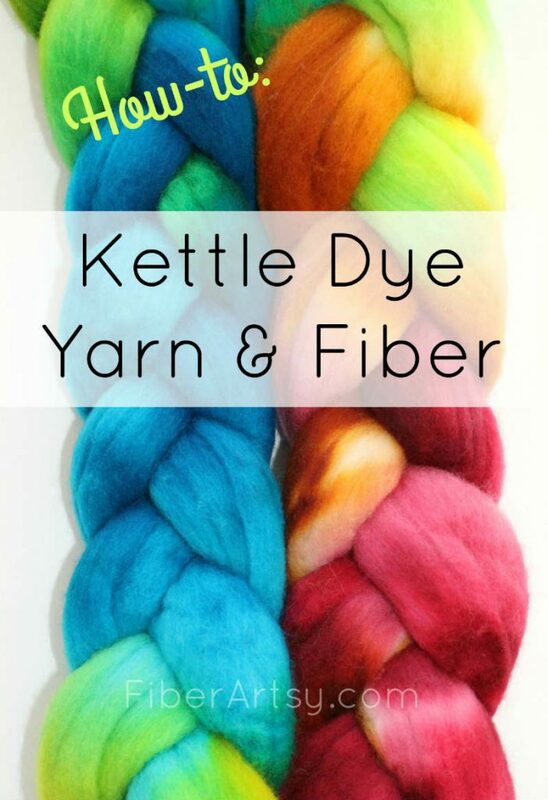 Have you tried kettle dyeing? How did it turn out?